Suffolk Area Retirees Local activist Rutha Bush, center, was recently named the Retiree PEOPLE Recruiter of the Year for 2016-17. 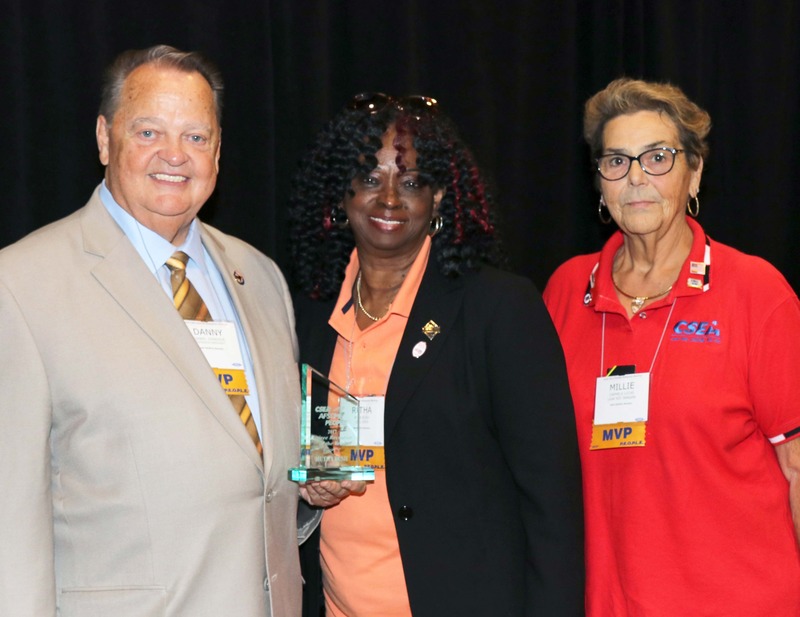 Congratulating Bush at the recent CSEA Retiree Delegates Meeting in Albany are CSEA President Danny Donohue, left, and CSEA Retiree Executive Committee Chair Millie Lucas, right. Rutha Bush of the Suffolk Retirees Local in the Long Island Region is the PEOPLE Recruiter of the Month for August. She recruited nine new PEOPLE members. She was also recently honored at our Retiree Delegates Meeting as the Retiree PEOPLE Recruiter of the Year for 2016-17. CSEA’s PEOPLE program protects and improves our jobs, benefits and pensions in Washington, Albany and in your community. Your support and participation in PEOPLE strengthens CSEA’s clout in the workplace, in the legislature, in your community and in the labor movement.